Black Beauty. Sony's Vaio S range currently encompasses over 24 models. 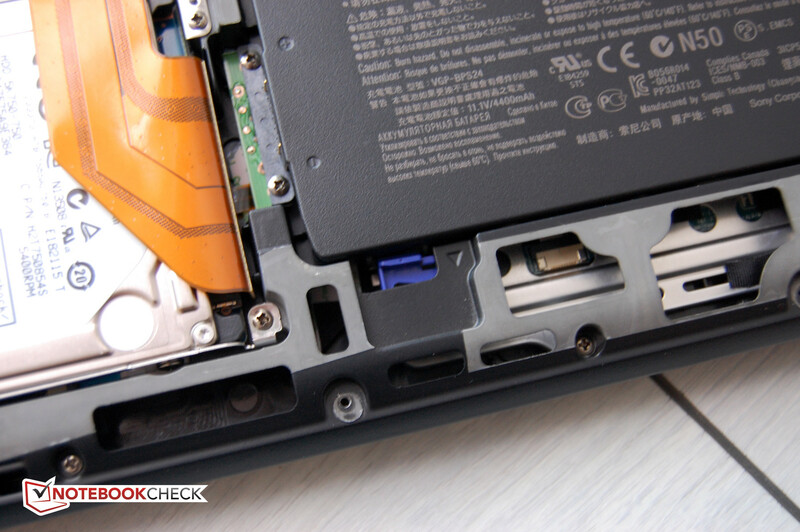 In this review, we have the balanced Vaio VPC-SE2M9E model under the microscope. The 15.5-inch unit definitely delivers in looks, but what about performance? Perusing the Vaio platform on Sony's homepage, you quickly get the impression that the S range includes all those devices that the manufacturer couldn't fit in anywhere else. On the other hand, you have to admit that Sony simply has a wide range of notebooks. The Japanese manufacturer divides its S range into three categories. Our test device belongs to the Vaio SE-15 range along with seven other models. Equipped with an Intel Core i7-2640M, 8GB of memory, a dedicated AMD Radeon HD 6630M and a BluRay drive, the all-over black Vaio is perfectly armed for all multimedia tasks. The model scores with an integrated 3G module. The matte 15.5 inch Full HD screen is also a plus. Chic, chic, chic - this describes the Sony Vaio VPC-SE2M9E/B's appearance best. The entire device is black and, except for the aluminum wrist rest, the Japanese manufacturer uses magnesium almost exclusively. The workmanship earns an "A" overall. The slim profile and the straight-line design both contribute to the elegant looks. Apparently, frills were not used on purpose - quite to our taste. With a height of just under 25 millimeters, the device can very well be called slim considering it is a full-blown multimedia laptop with an optical drive. The lid is delicate, but looks good. However, the thin frame affects stability which means the screen warps easily and can exhibit cracking noises. The hinges could also be a bit bigger and more rigid as they do not always have a firm grip on the display. When letting go of the screen suddenly after adjusting it, it teeters for over two seconds. Moreover, the hinges limit the opening angle to slightly over 135 degrees. However, the rest of the device is rigid. Everything seems to be made of one piece for a unibody-like design. The case only yields in the keyboard area when strong pressure is applied. Nevertheless, it is not troublesome while typing. We find the 2 kilogram weight (4.4 pounds) to be very agreeable. The device's portability is maintained despite the fairly large screen and the extensive equipment. Sony incorporates the power LEDs very discreetly and appealingly. One lights up directly in the power button and another at the charging socket on the case's upper right edge. 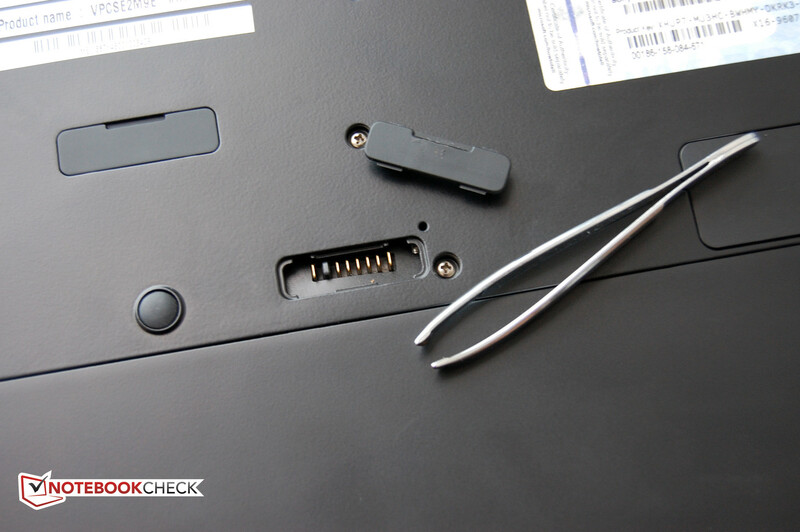 Sony builds the eject button for the optical drive above the keyboard's left. This design prevents unintentional opening if the notebook bumps against an object during transport. Sony sees its Vaio VPC-SE2M9E/B as an entertainment and multimedia notebook. The connectivity options should then satisfy this claim. The full HD 15.5 inch display is a good start, but the included BluRay drive is also a must in this sector. Sony places all interfaces on the case's right and left, leaving the rear free of interfaces. A handy slider for enabling and disabling all wireless communication modules is on the front. An LED conveniently shows the slider's position. Two other LEDs indicate hard disk activity and charging status, respectively. 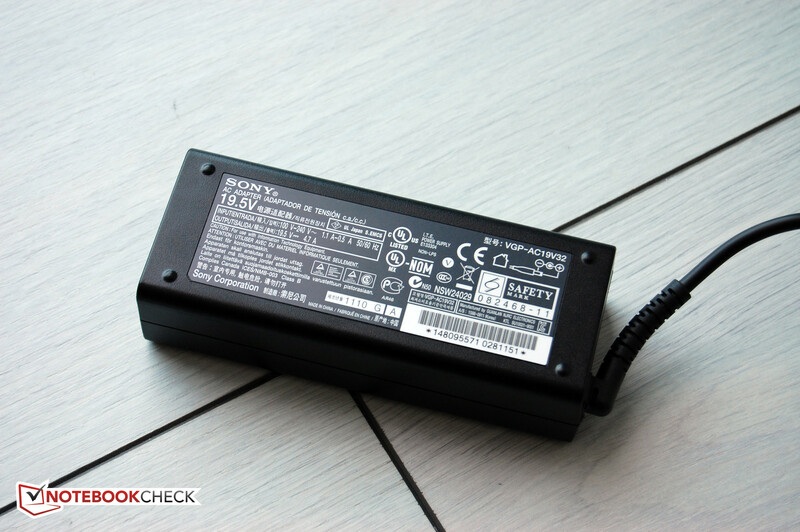 The device can also be used when the battery is not inserted provided that the AC adapter is active. 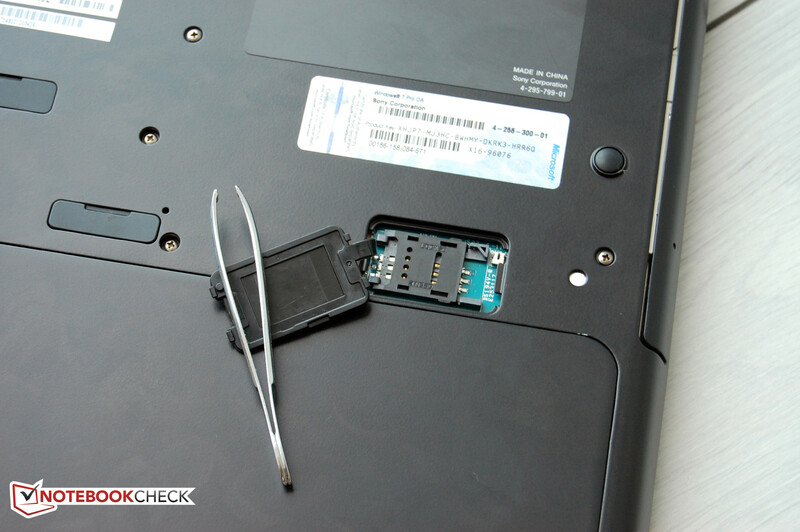 However, a maintenance cover has to be removed first before the battery can be taken out. A jack for headphones or active speakers is located on the case's left far back. Unfortunately, it gets much tighter on the right. The power socket and Kensington lock are at the rear and are followed by two USB 2.0 and one USB 3.0 ports. An HDMI socket with HDCP support is available for outputting digital content. Projectors and older monitors can be connected to the VGA socket. 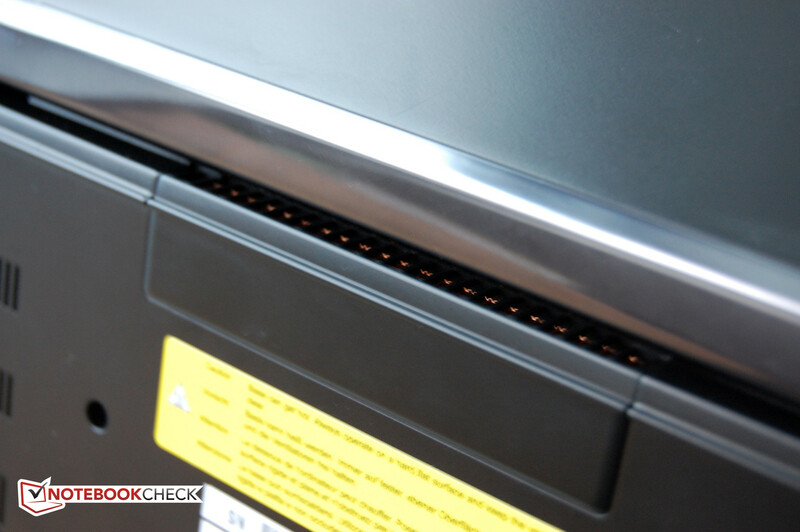 The Gigabit LAN port is only about eight centimeters away from the case's front - a rather unusual position. The LAN cable will very likely get in the way every now and again. We would also have preferred to see the monitor ports further to the back, if not on the rear. There are also two card reader slots for MemoryStick and SD cards on the very front. The latter supports SDHC and SDXC. Three more interfaces are located on the bottom, all behind fiddly rubber or plastic covers. The first is a docking port, which makes Sony's VPC-SE2M9E/B office compatible. The battery port connects to an optional sheet battery that is "mounted" underneath the device and allegedly extends the battery runtime significantly. The third cover hides an HSPA-capable 3G module. 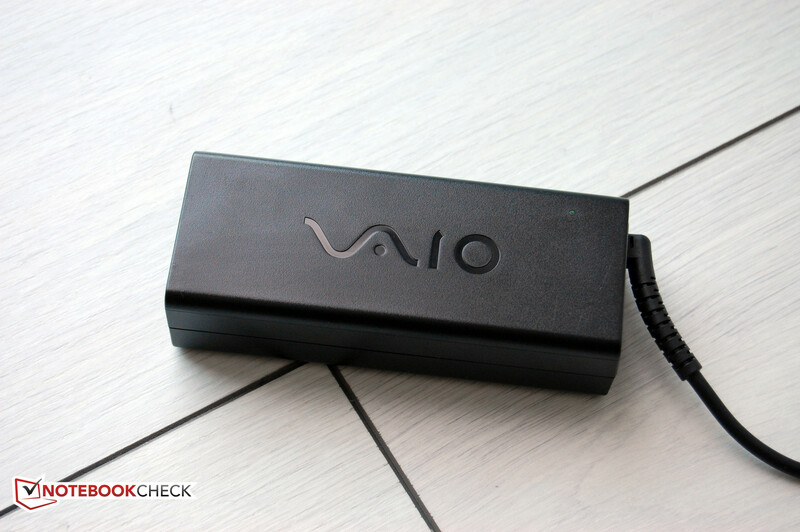 The Vaio Smart Network is always visible in the notification area of the taskbar and displays the status of WLAN, Bluetooth and 3G, each of which can be enabled or disabled with one mouse click. An Intel Centrino chip takes care of WLAN with support for the 802.11a/b/g/n standards. The n-standard supports both the 2.4 GHz band as well as the less heavily used 5 GHz band. Bluetooth version 3.0 + HS is installed. Thanks to ad-hoc usage of wifi for data transmission, Bluetooth 3.0 + HS allows theoretical data rates of up to 24 MB/s. The standard UMTS module in this configuration contributes greatly to the mobility of Sony's VPC-SE2M9E/B. It is an HSPA-capable 3G module that supplies speeds of up to 14.4 MBit/s in downstream and a maximum of 5.76 MBit/s in upstream. Actual data rates are very dependent on the provider and how many users are logged into the same network cell as the module. In the test, we regularly achieved download speeds of 7 MBit/s with an O2 card in a small town at Lower Rhine, a very good rate considering the region. Our results underline the 3G module's performance. The wifi module also works very well. A comparison with an iMac and a netbook - privately owned by the tester - showed that Sony's Vaio VPC-SE2M9E/B achieved the maximum range and often still had a signal where the iMac and netbook had lost it. For fans of cabled communication, the Sony Vaio has a Gigabit LAN port available with a Realtek controller. The Sony Vaio VPC-SE2M9E/B is a multimedia notebook, but its docking station and pleasantly large screen will accommodate business usage as well. Security is an issue in business, so the Vaio features the almost compulsory Kensington lock as well as a fingerprint sensor between the mouse keys. Like many current notebooks, the VPC-SE2M9E/B's scope of delivery is poor. In fact, there is only the usual paperwork and a quick start guide, power consumption specifications, instructions for the 3G module and a Vaio product catalog. However, anyone who takes a look at the list of accessories on Sony's website will be overwhelmed by the breadth of offerings. There are cases, mice and keyboards to name a few. The docking station VGP-PRS25 and the sheet battery VGP-BPSC29 that doubles the total battery capacity, each for EUR 150 (~$193 USD), are especially interesting. 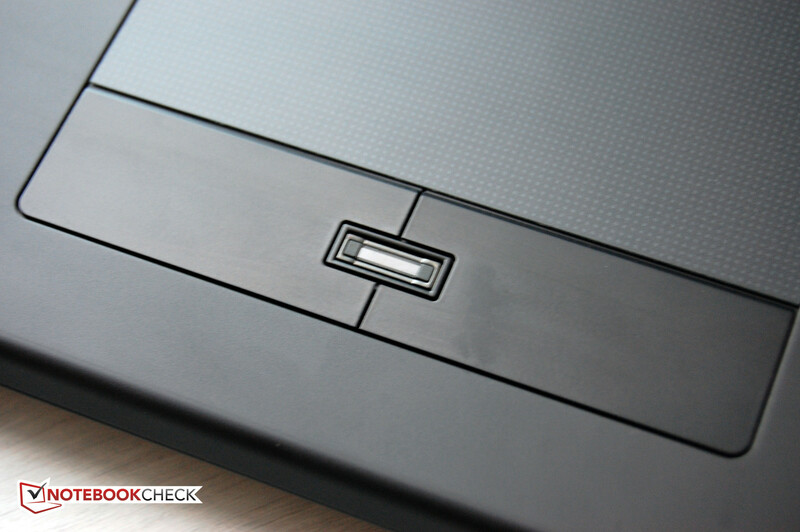 A big maintenance cover on the bottom enables easy access to both hard disk and RAM. Other upgrades are not provided. If you want to clean the fan, you'll have to disassemble the case more than Sony probably intended its end-users to do. The fan is located above the keyboard between both display hinges. Sony grants a standard 12 month warranty. It can be extended by another 12 months for free when the device is registered via the dealer. If you need even more security, Sony has additional warranty products in it range. For example, a one-year or two-year warranty extension will cost EUR 99 ($127 USD) and EUR 179 ($231 USD), respectively. Sony charges EUR 289 ($373 USD)for a three year warranty with on-site service. Like Sony's entire Vaio VPC-SE2M9E/B chassis, the keyboard is black and merges seamlessly into the overall elegant look. 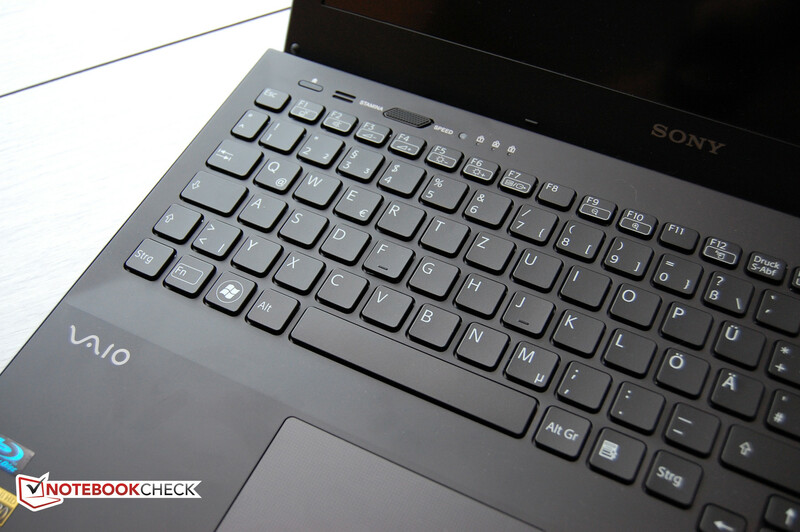 Sony installs a chiclet-style keyboard commonly found in slim notebook designs. These "chewing gum" keyboards are characterized by the fairly large gap between the single keys. These keyboards only need a low build which makes them perfect for slim notebooks. 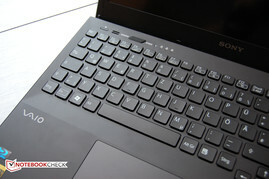 The key size in Sony's Vaio is a pleasant 15 millimeters. Only the cursor, degree and F keys are smaller. A full-blown number pad is included with dedicated "Home", "End", "Insert" and "Delete" keys. The keys sport a clear pressure point and the key drop is sufficient for speedy touch-typing. Sony places additional keys with proprietary special functions above the F key row. In the upper right beside the power button, keys labeled "ASSIST", "WEB" and "VAIO" are found. While the "WEB" button is self-explanatory, the other two need a brief explanation. "ASSIST" provides the user with tools for troubleshooting and solving like system recovery. This button's function can be opened while running Windows as well as when the device is turned off. 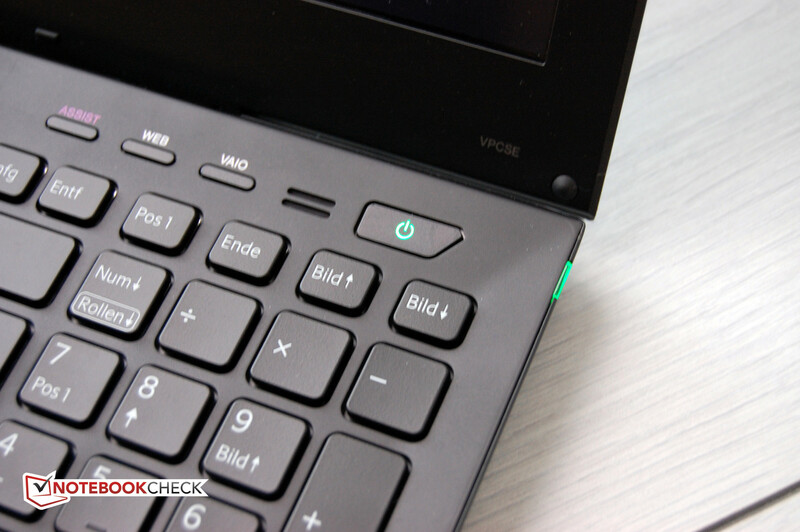 The "VAIO" button opens a number of hardware and software settings. On its right, there is a slider with the options "STAMINA" and "SPEED" for choosing the graphics card - so either processor graphics or dedicated card. We believe it is a very convenient function. Nevertheless, automatic switching via Optimus in current nVidia models is superior because the screen flickers for a moment with Sony's solution. The keyboard's LED light is also very handy as it enables hitting the right keys even in the dark. Additionally, the mixture of white LEDs and the midnight black notebook is an eye-catcher. The black touchpad is quite large at about 95 x 55 millimeters. 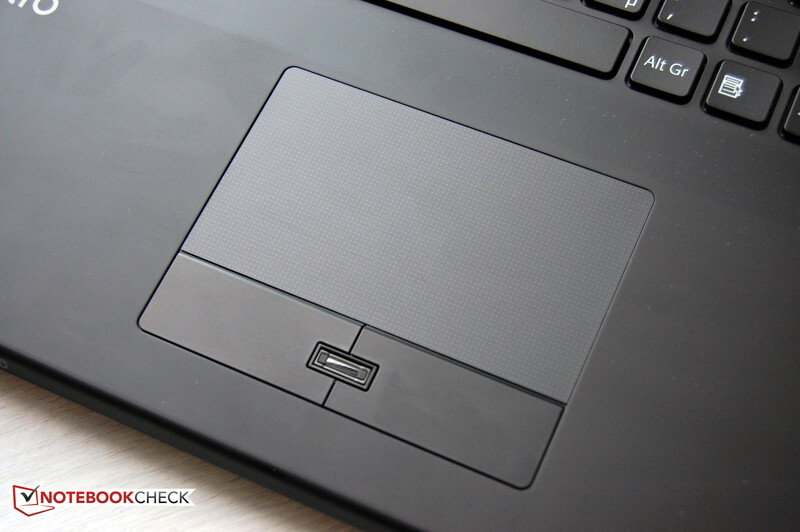 The surface of the touchpad supports multi-touch use and allows precise gesture control with clear borders. Both click keys can only be accurately used in the outer areas. The key drop decreases toward the center and the feedback can become unclear. After routine use, however, this is a non-issue for the user. 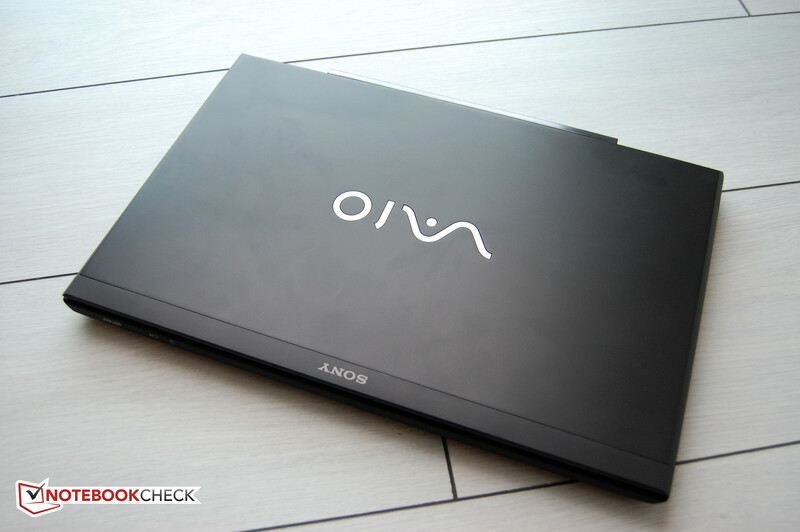 The high-end impression that Sony Vaio VPC-SE2M9E/B makes with its case continues with the screen. At 15.5 inches diagonally, it is suitable as a multimedia machine and also looks good in business environments, which is particularly impressive considering the moderate weight. The native Full HD resolution of 1920 x 1080 pixels virtually calls for multimedia use such as BluRay playback. 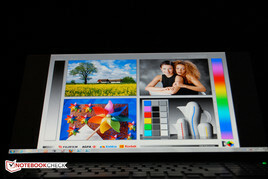 The non-glare screen is almost shunned in the multimedia category because it does not reproduce colors as brilliant as its glossy counterparts. However, glossy screens often exaggerate colors to undesirable levels. We also appreciate a matte screen all the more in a device with such a vast application field. Our lab measurements also confirm good screen rates. The average brightness is 238 cd/m2 and should be enough for even brighter surroundings under mellow sunlight, like on a terrace. The pleasant, homogeneous illumination of 87% decreases strongly in the lower left corner, although this will only be noticeable by the most perceptive of users. The black value of 0.41 cd/m2 is agreeably low and leads to a high contrast of 622:1. 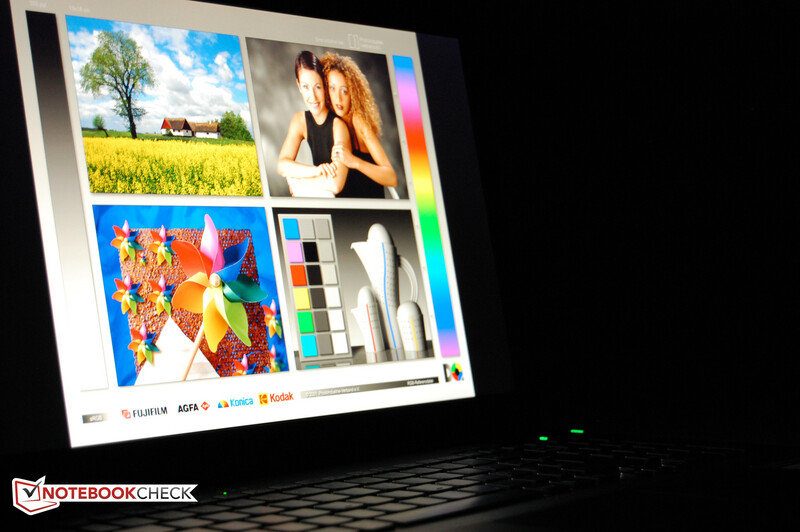 Sony's Vaio VPC-SE2M9E/B reproduces colors and gray shades well. The colors look quite natural and do not have an overlying color. The black value is very good and results in a saturated reproduction of dark movie scenes or picture areas. The high contrast contributes to this effect. But we also have to criticize the Vaio's screen a bit. The sRGB color spectrum's coverage of nearly 80% is satisfactory, but the screen wastes a lot of its potential since a large part of its color space goes beyond the limits of the sRGB standard. This is particularly evident in the yellow range. We used Acer's TravelMate 5760G-2454G50Mnsk for comparison. The Acer plays in another league with an sRGB coverage of 88 percent. Alright in outdoor use. Please avoid glaring sunlight. The Sony Vaio VPC-SE2M9E/B's low weight in relation to screen size and the non-glare screen speak to its mobile outdoor use. Although it does not achieve an extremely high brightness and you should avoid direct sunlight when possible, Sony's Vaio VPC-SE2M9E/B copes well in all other cases. 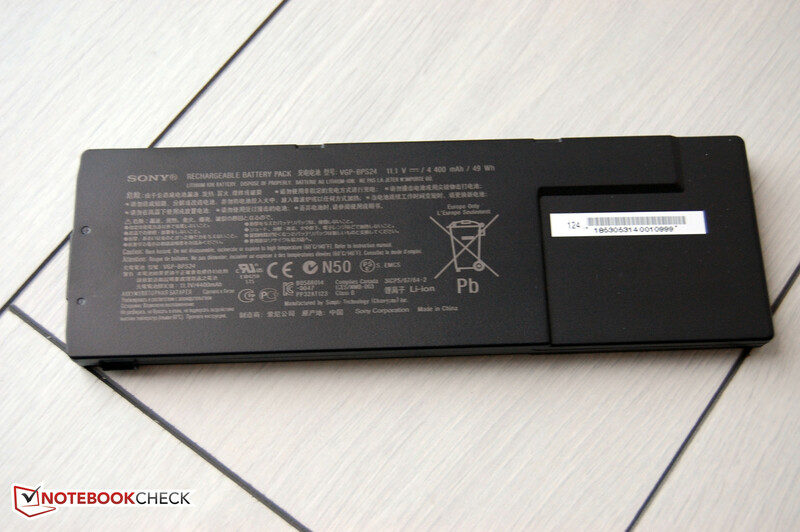 Moreover, since the maximum brightness is maintained on battery power, the adapter can be left at home or in the case. The screen's virtually flawless presentation finds its pinnacle in excellent viewing angle stability. 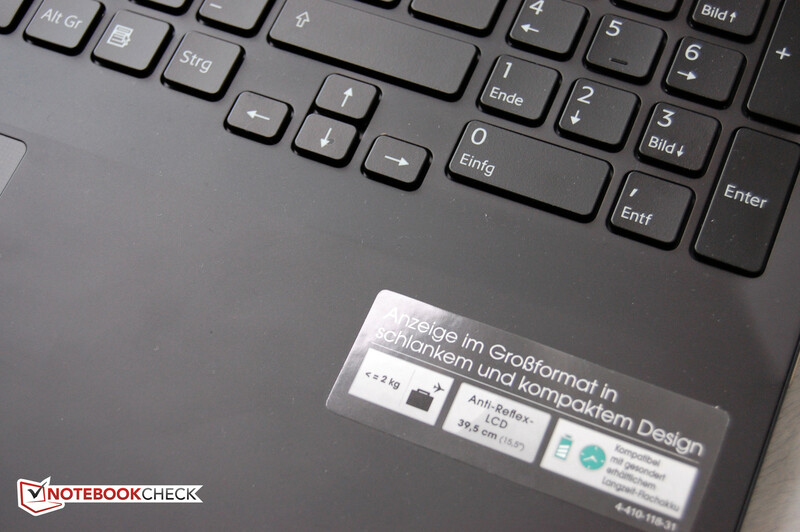 The IPS screen built into Sony's Vaio VPC-SE2M9E/B does not show any weaknesses on either the horizontal or vertical plane. Even in extreme angles, the colors remain stable to the largest extent though the contrast and the brightness weaken a bit. The bottom line is that this model provides first rate display performance. Several viewers sitting at different angles, will all have a perfect view of the displayed content from this screen. 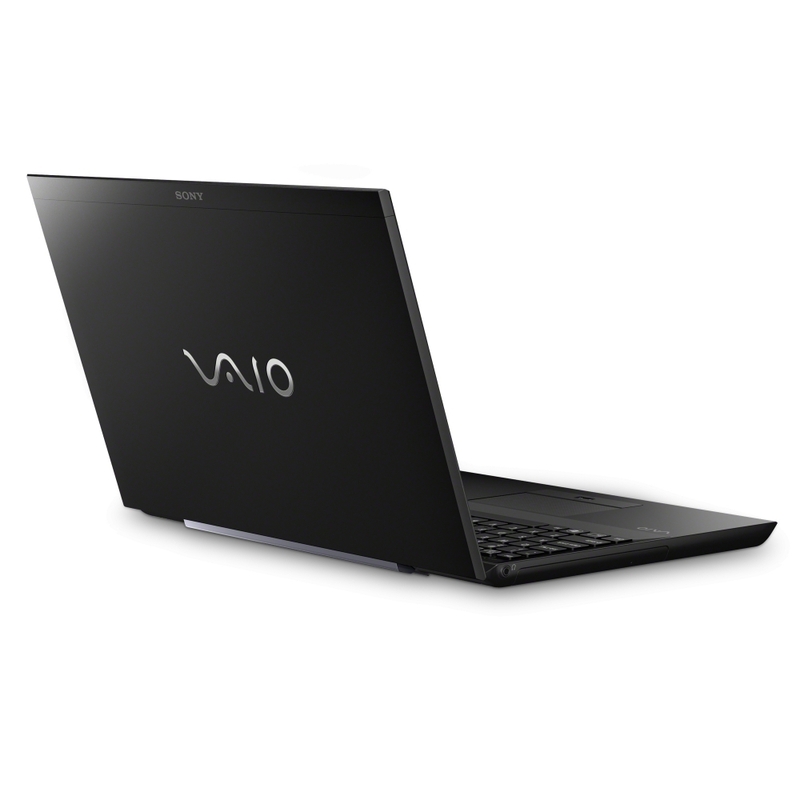 Sony's Vaio VPC-SE2M9E/B is powered by a dual-core CPU that is still nased on the Sandy bridge architecture. 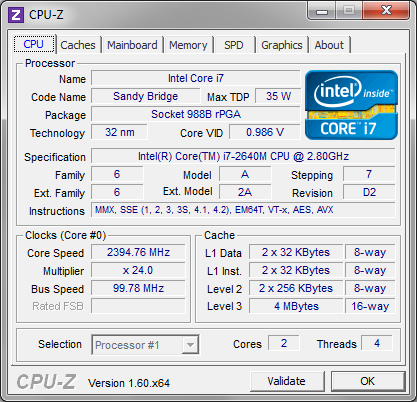 Nonetheless, the Core i7-2640M is extremely fast and was one of the fastest dual-core notebook CPUs until the end of 2011. It has a base clock of 2.8GHz and, assuming favorable thermal conditions, the CPU can achieve speeds of up to 3.5GHz on one core and 3.3GHz on both cores via Turbo Boost. The level 3 cache of 4MB is also quite high. 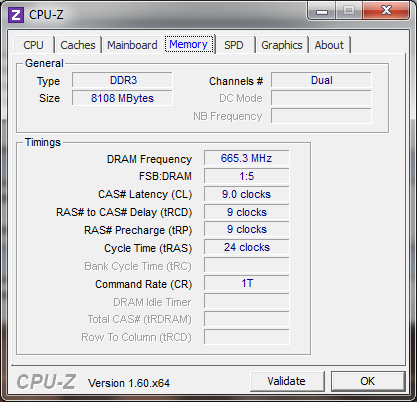 The TDP of 35 watts, however, is not energy-efficient. 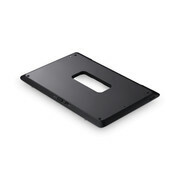 It reserves the Core i7-2640M for larger multimedia notebooks rather than ultra-portable devices. In this case, we believe it is perfect for Sony's Vaio VPC-SE2M9E/B. We analyzed the Intel Core i7-2640M CPU in the Vaio by using Cinebench R10 and R11.5. We tested the processor's pure performance in both single and multi-thread operation. The Turbo Boost technology worked perfectly in the tests. Both cores could reach their maximum clock in the single as well as multi-thread tests. Results were as expected with Cinebench R10 records 9778 points in the 32bit and 11746 points in the 64bit multi-thread benchmark. Sony's Vaio VPC-SE2M9E/B 3.07 achieves 3.07 points in Cinebench R11.5 - also as expected. 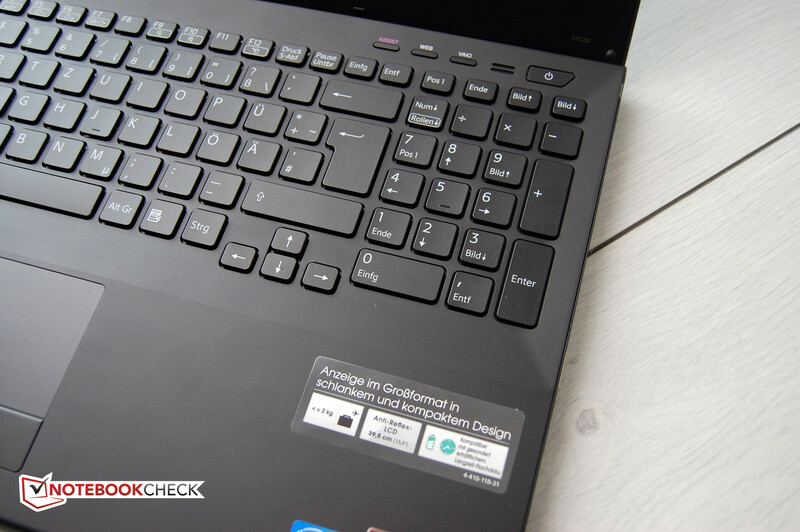 However, comparable devices such as Lenovo's ThinkPad X1 (NWK3QGE) were able to score as much as four percent higher in synthetic benchmarks. We evaluate the general performance of the system by using the benchmarks PCMark 7 and PCMark Vantage. The scores are based on how well the installed components interact with each other and on their efficiency. 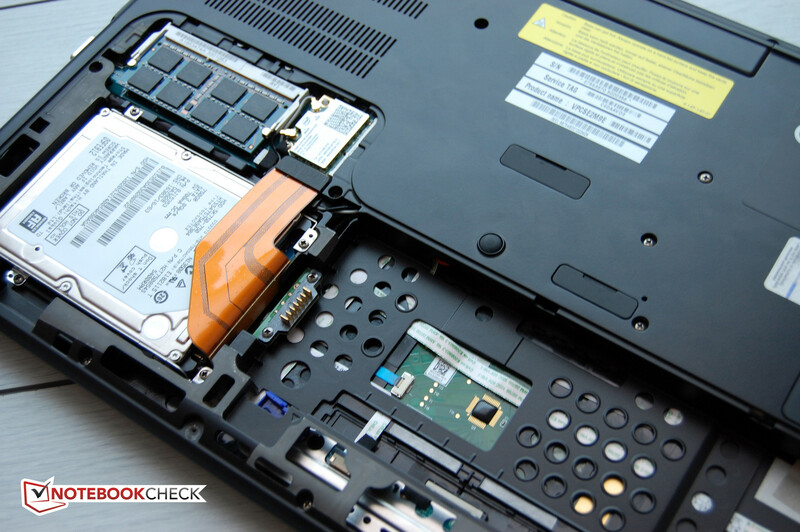 A fast hard disk, such as an SSD, can lead to considerably higher scores. We also look at Window's performance index, which uncovers potential bottlenecks. According to the benchmarks, the weakest component is the hard disk. This is not surprising considering that tlled drive is a conventional hard disk with a speed of 5400 revolutions per minute. The other subscores in the PCMark tests are not neither great nor unacceptably bad. The overall performance is very appealing for use as both a multimedia device or a business notebook. 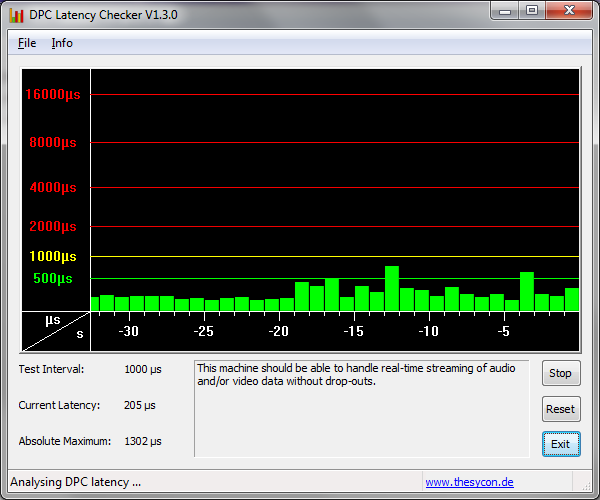 The DPC latency Checker shows no abnormalities in the form of red spikes. The default drivers should not have any problems or adverse affects on real-time streams. The 2.5-inch Hitachi hard disk in Sony's Vaio VPC-SE2M9E has a capacity of 750 GB. It is a conventional HDD and is appropriate for our application field especially since a conventional hard disk fuses high capacity with a low price. The TravelStar 5K750 spins at 5400RPM and is easy on the ears at the expense of performance. This hard disk is an average performer. Tests with HDTune and CrystalDiskMark confirm the average transfer rate of 74.6 MB/s, a rate which is not exactly awe-inspiring. The access speed of 20.5 milliseconds is also average at best. 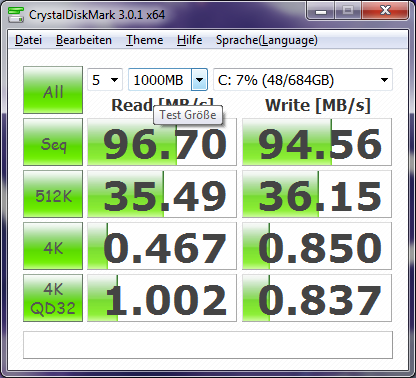 CrystalDiskMark specifies rates of 96.7 and 94.6 MB/s in sequential read and write. In brief, the performance is sufficient for the intended field of use. One positive of this average performance is that the hard disk doesn't annoy with loud noises or high-pitched hums. 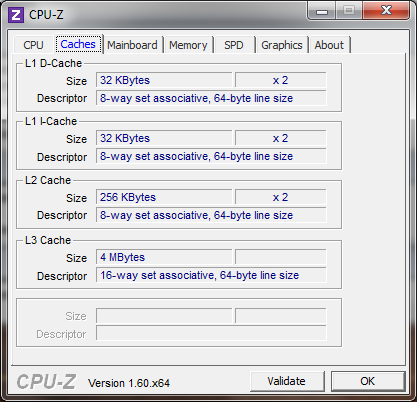 To tweak graphics performance, the user can switch between either the integrated processor graphics or the dedicated AMD Radeon HD 6630M. Sony installs a slider for this above the keyboard. "STAMINA" enables processor graphics and "SPEED" activates the dedicated 3D card. 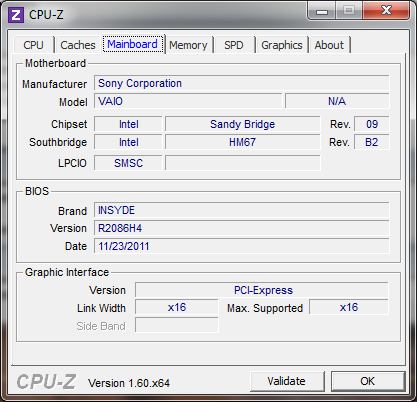 The integrated graphics card is a "standard" card of the Sandy Bridge processors. 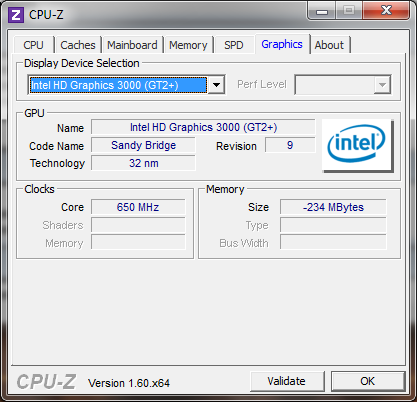 The Intel HD Graphics 3000 can overclock its computing cores when necessary by using Turbo Boost. In terms of performance, Intel's HD Graphics 3000 is about on par with dedicated entry-level models such as AMD's Mobility Radeon HD 5450. However, using the integrated graphics is not required for all graphic-heavy requirements. Playing DVD and BluRay movies also work perfectly with it. When the user wants the greatest possible 3D power and doesn't need the extended battery life, the dedicated AMD Radeon HD 6630M graphics can be enabled via the slider. It is a DirectX 11 capable midrange model with 480 Unified Shaders, support for Eyefinity+ and the newer UVD3 video decoder. Similar to the 5000 range, the 6600M series has an integrated HD audio controller that is capable of transmitting 7.1 surround sound via HDMI and Displayport. Games are definitely not the Sony Vaio VPC-SE2M9E/B's specialty, but that doesn't mean that it can't play a fairly up-to-date game every now and again. The midrange graphics card quickly finds its limits in demanding 3D tracks like Battlefield 3. Older games should run without problems and even current titles are often rendered smoothly in low details and at an adjusted resolution. For example, CoD MW3 and Mass Effect 3 can be played on high detail levels without major losses. In return, Risen 2 runs only reasonably well on the lowest settings. Less demanding games, such as Fifa 2012, are no problem for the graphics card. Although we attempted to install and load Alan Wake, we could not alter the settings nor did the game even start. An overview of game/graphics card compatibility can be found in our extensive list. This part of the review deals with one of the few real points of criticism on Sony's Vaio VPC-SE2M9E/B. The device is only pleasantly quiet when it is idling, e.g. when reading and word processing tasks or viewing pictures. However, the very sensitive fan starts up when surfing on the Internet, generating a noise level of up to 32 dB when idle. When the fan really speeds up, it gets almost unbearably loud. Its blades ran at full speed in our benchmarking tests. Here, it achieved a noise level of up to 49.4 dB, a level that can disturb normal discussions. In contrast, the hard disk is very inconspicuous. Although it consistently emits a quiet noise, it never gets obtrusive. 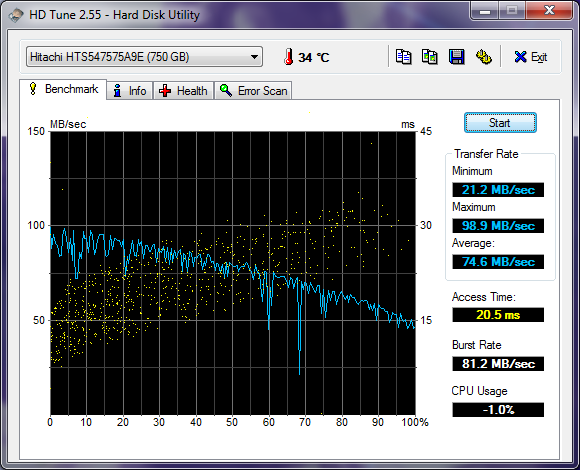 The BluRay drive reaches 35.4 dB during movie playback, which is normal for this device category. In addition to the system noise, the temperature development is not one of the Vaio VPC-SE2M9E/B's strengths either. The aluminum wrist rest always stays pleasantly cool. Unfortunately, a distinct hot spot develops in the bottom's upper area with temperatures of up to 47.4 degrees Celsius (117 degrees Farenheit). Not everyone will find that comfortable on the skin. The processor heats up a bit too much during full load. In our stress test comprised of Prime95 and Furmark, the core temperature increases to a maximum of 96 degrees. That is apparently too much for the CPU, as we can't explain why it occasionally throttled to below the base clock of 2.8 GHz any other way. 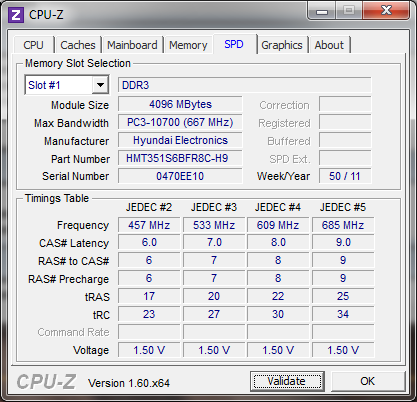 The processor only worked at 2.2 GHz at times. A 3DMark06 run while in a "hot" state tested whether this behavior will be reproduced in everyday use. The results are similar to results after a cold start, so throttling during everyday use should not be a problem. Nevertheless, we would have expected a better thermal design, especially in view of the very noisy fan. (-) The average temperature of the palmrest area of similar devices was 29.1 °C / 84.4 F (-3.5 °C / -6.3 F). The speakers in the test model are functional - not more and not less. The speakers are located above the keyboard's left and right and suffer from the lack of volume. Although the sound is fairly clear and presents good trebles, the midranges and basses lack force. The speakers are sufficient for movies, but music enjoyment leaves a lot to be desired. We recommend using the audio jack for extended movie or music sessions. The standard battery in the Sony is not impressive with a capacity of only 49 Whr. Nevertheless, the device should provide a viable battery life when not under demanding tasks. However, Sony's Vaio is only energy-efficient when the dedicated graphics card is disabled and in "STAMINA" mode. Here, the minimum power consumption is only 8.8 watts. As soon as the AMD graphics is enabled via "SPEED" mode, however, the power consumption skyrockets drastically. The 15.5 incher will consume up to 22.5 watts when idling. Even Asus' K93SM-YZ085V with an 18.4 inch screen is more modest. 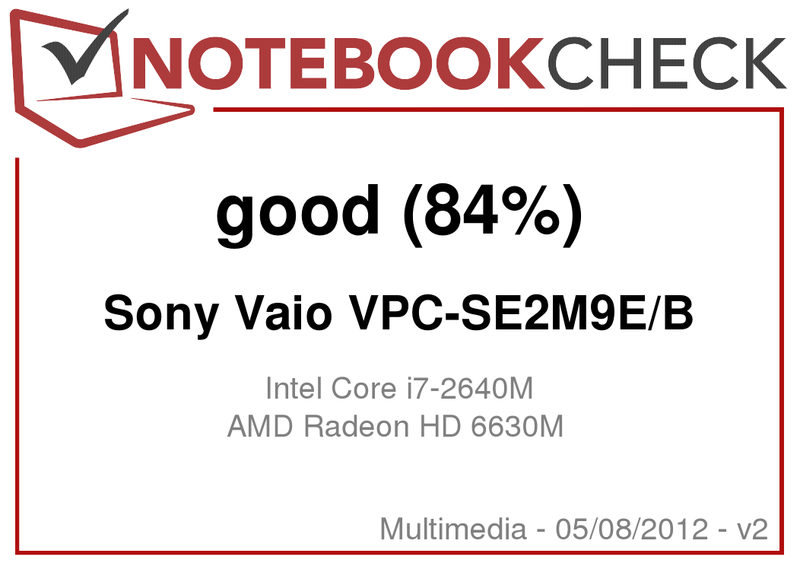 In return, Sony's Vaio VPC-SE2M9E/B draws a respectable maximum of 75.8 watts, which is not abnormal for a notebook of its size and class. Our review unit reached a good runtime of 6:15 hours when used only for reading and in the lowest brightness settings with disabled communication modules. Its movie playback runtime is also average at 3:18 hours (DVD playback) and 2:43 hours (BluRay playback) under maximum brightness. Still, this should be enough for almost every lengthy Hollywood drama. The battery lasts for 3:30 hours when surfing via wifi under a screen brightness of about 150 cd/m2. 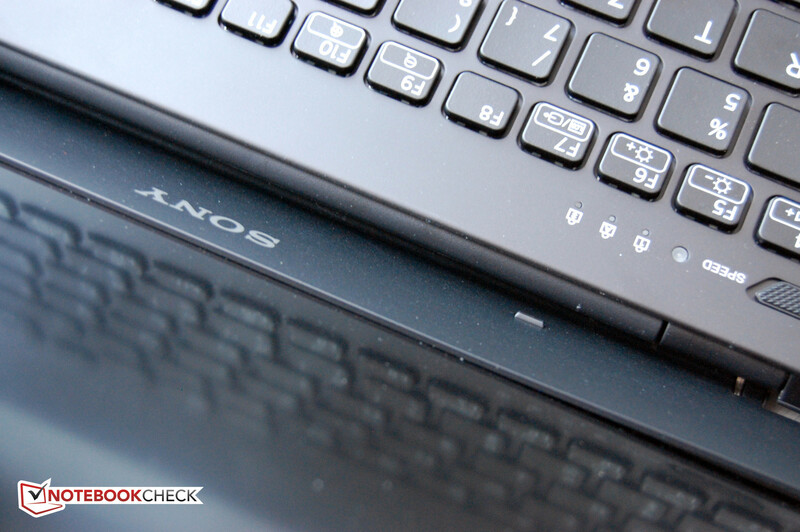 When Sony's Vaio is put under heavy load, the battery drains completely after just one hour. This is acceptable considering the low battery capacity. If you put value on battery life, however, you should consider buying the optional sheet battery with the same capacity as it will effectively double runtime. 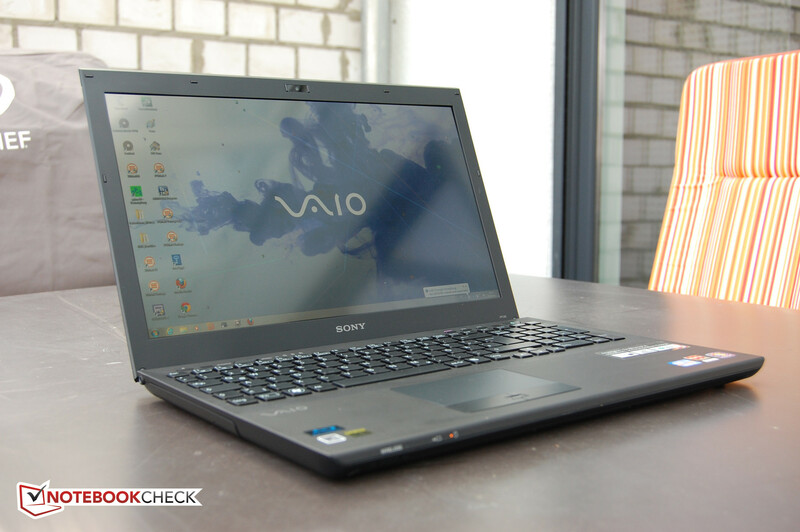 The Sony Vaio VPC-SE2M9E/B runs through most of our tests almost effortlessly in our lab. It starts with the elegant, completely black multimedia notebook's excellent workmanship. The connectivity is absolutely fitting for its application field. What's more: The mobility is enhanced considerably thanks to the 3G module in conjunction with the light weight considering its class size. 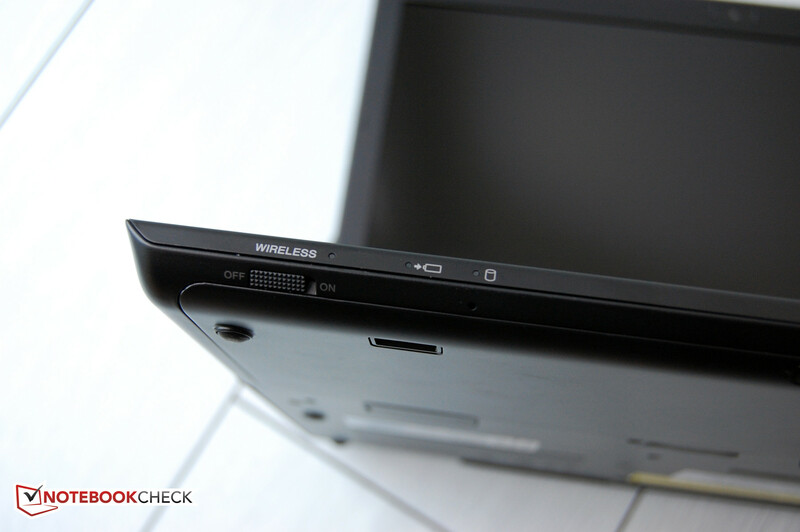 The docking port makes the Vaio more apt for business use. Moreover, the IPS screen in the Sony Vaio VPC-SE2M9E/B also earns kudos. 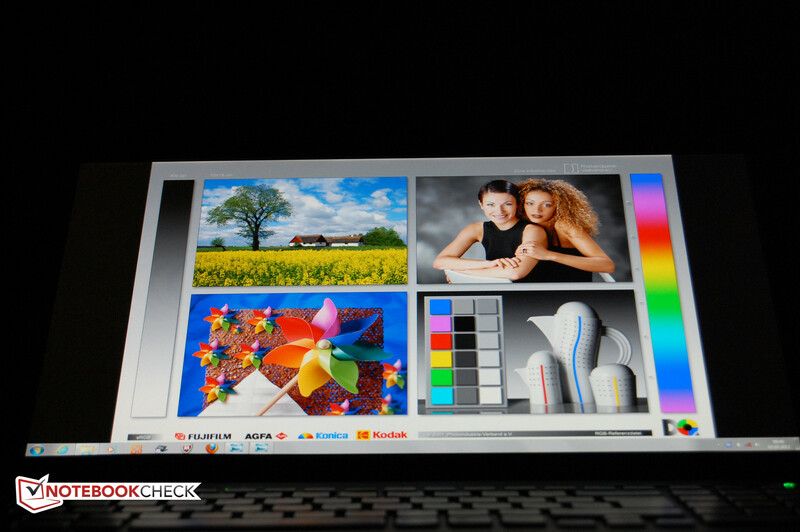 It renders the maximum Full HD resolution in a diagonal of 15.5 inches. Additionally, the screen thrills us with a non-glare surface as well as good lab results. Brightness, contrast, black value - everything is on a good to very good level. 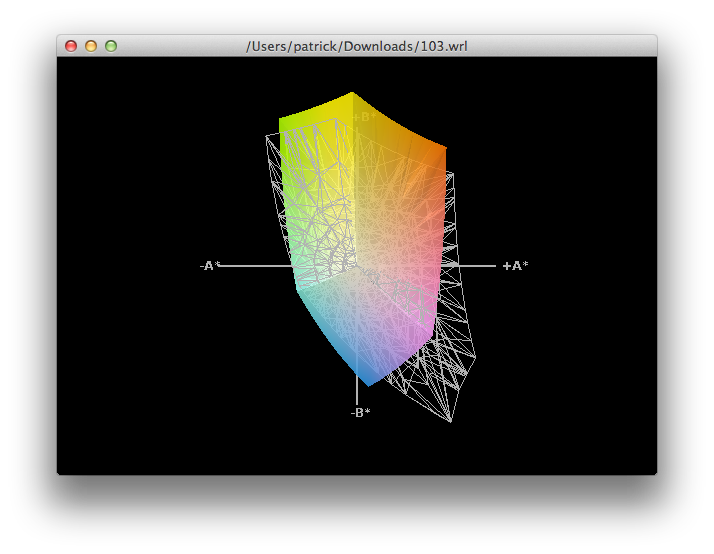 Merely the color space is a bit limited. However, the high viewing angle stability easily makes up for that. There is nothing to complain about in terms of performance either. On the contrary: Sony's Vaio VPC-SE2M9E/B achieves the results expected considering the selection of components in all benchmarks. The hard disk is not the fastest of its kind, but well-chosen for the application field. The integrated Intel graphics is mostly sufficient for everyday use. It is possible to quickly switch to the dedicated, midrange card for the every so often 3D game. Even a few newer titles are fun to play in low details. The battery life, unfortunately, did not quite convince us. As long as the processor graphics is active, Sony's Vaio VPC-SE2M9E/B proves to be quite energy-efficient. However, the laptop consumes a lot of power when the dedicated GPU is enabled. Regardless, the battery life is still acceptable. The fan in Sony's Vaio is quite the annoyance. It is only mute during absolute minimum use, meaning that any more processing load will cause it to jump in volume almost immediately. EUR 1599 (~$2000 USD) is a lot of money for a notebook. However, the price demanded for the Sony Vaio VPC-SE2M9E/B is justified in our opinion. 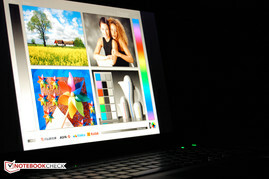 You get a very high-quality notebook with balanced equipment, good mobility and a great screen. 12 Months Warranty, 12 month warranty; 24 months when registered via dealer. The fan blows out of the device's rear. Makes you mobile: the 3G module. 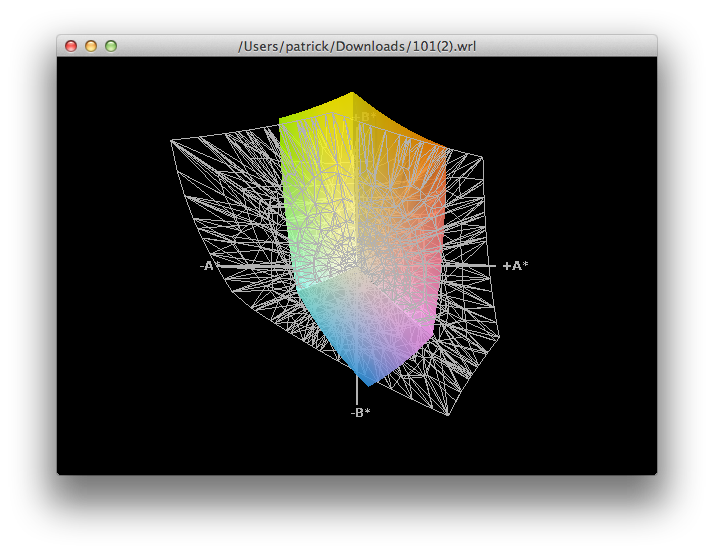 ... and without a disc. Then again, it is a bit reflective. Handy: the slider for wireless modules. Nicely designed: the power LEDs. The fingerprint sensor takes care of security. ... is to be big, but slim and compact at the same time. The great workmanship and the very good screen. That's what makes a good notebook. A little more battery life to take better advantage of the high mobility. How loud such a small fan can get - and annoying! There is plenty of competition in this performance and size category. We would mention the Sony's sister model Vaio VPC-SE1Z9E/B, HP's Envy 15-3040nr and Asus' U44SG as its current contenders.